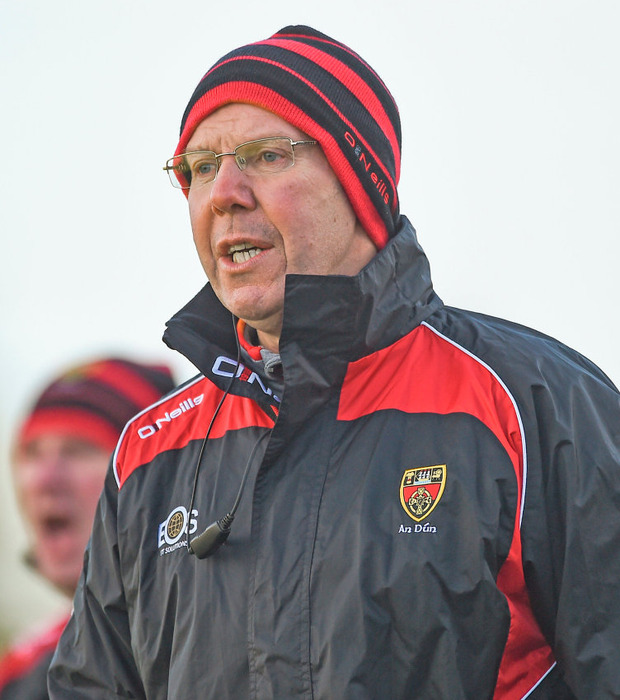 Down manager Eamonn Burns was sent to the stands for the second half of this Division 2 league tie last night, from where he watched his side fall to an agonising defeat to table leaders Cavan. In an entertaining match, late scores from substitute Seánie Johnston and Dara McVeety, and two more in injury time from Raymond Gallligan, a '45, and Conor Bradley, managed to shake off a stubborn Down challenge. Burns got a stern talking to from Kerry referee Pádraig O'Sullivan after an incident just before the interval when he appeared to get involved with one of the Cavan mentors. The incident raised tension as the players were leaving the field but the match was free of spite and played in good spirits. Cavan, unbeaten this season, moved a step closer to an instant return to the top tier with a storming performance from the outstanding Gearóid McKiernan who scored four points from play and was a monumental influence. They also had a huge contribution from the bench with Bradley and Cian Mackey both kicking two points and Johnston another. Down, now nearer the drop zone, did not have the same depth. But Cavan rode their luck too. Down had goal chances in either half and were wasteful, a flaw that cost them in the previous round then they lost at home to Clare. Two goal chances 15 minutes into the second half were both blown at a time when the game was delicately balanced, with Down only one point behind. First Ryan Johnston had an effort blocked brilliantly by Galligan and a minute later Conal Harrison threaded a delightful pass through to Donal O'Hare who put his shot past the far post. Down were swiftly punished when Cavan hit them with two fine scores from Bradley and Oisín Kiernan to lead 0-12 to 0-9 with 20 minutes played. To their credit Down came again. In the final ten minutes three unanswered points had them level, before Cavan finally broke free. Down took a slender one-point lead into the interval, an injury-time free, won and converted by O'Hare leaving them 0-7 to 0-6 in front. The early running came from Cavan who went in front through McKiernan in the fourth minute and were two ahead when Stephen Murray had a goal chance blocked five minutes in. Then they went off the boil, failing to score for 15 minutes, during which time Down had the better of the play but were let down by some poor finishing. They finished the first half with seven wides, missed two goal chances and dropped three point attempts short. But O'Hare and the recalled Harrison troubled the Cavan full-back line, sharing five points between them, Harrison selling a lovely dummy before his second that duped Pádraig Faulkner. Harrison had them level in the ninth minute, before Anthony Doherty landed a 50-metre free to edge them in front three minutes later. Conor Moynagh ended Cavan's long barren spell with a point in the 20th minute but Down were still threatening. O'Hare kicked a sweet sideline and ten minutes from half-time Harrison had a goal chance saved by Galligan. That sparked a good Cavan spell as points from Caoimhín O'Reilly, McKiernan and Bryan Magee, a free, had them back in front approaching half-time, Down finished with points from Johnston and O'Hare as the lead changed hands again. The second half saw the standard of football rise and Cavan head into their final two matches well placed to return to Division 1. Down, who escaped relegation last season in injury-time on the final day, face another fight for survival. Scorers - Cavan: G McKiernan 0-4; C O'Reilly 0-3 (2fs); C Mackey, C Bradley 0-2 each; B Magee (f), C Moynagh, O Kiernan, S Johnston, D McVeety, R Galligan (45) 0-1 each. Down: D O'Hare 0-4 (1lb, 2f); C Harrison 0-3 (1f); A Doherty 0-2 (2fs); R Johnston, S Millar, C Mooney, K McKernan, R Wells 0-1 each. Cavan: R Galligan; Conor Brady, P Faulkner, Jason McLoughlin; S Murray, Ciarán Brady, E Flanagan; G McKiernan, B Magee; O Kiernan, C Moynagh, M Reilly; N Clerkin, D McVeety, C O'Reilly. Subs: C Mackey for Conor Brady (25 mins); A Cole for Clerkin (half-time); C Bradley for Moynagh (45); S Johnston for Flanagan (64); K CLarke for Murray (67). Down: M Reid; C Flanagan, B McArdle, A Doherty; R Wells, N McParland, C Mooney; P Turley, N Donnelly; S Millar, C Maginn, R Johnston; D O'Hare, C Francis. C Harrison. Subs: K McKernan for Francis (45 mins); D McKibbin for Millar (inj, 55); C Poland for Donnelly (60); R Millar for O'Hare (68).